View out the front door of, My Old Historic House. Every morning I peak out the window and see what the Mississippi is up to. Clarksville,Mo. Mississippi River front park. Steps to the Mississippi where you can touch it or dangle your feet in it. Right in front of ,My Old Historic House, about 100 feet away ,is the Mighty Mississippi River. It is the largest river system in North America,flowing entirely in the United States. The River rises in Western Minnesota and meanders slowly southwest for 2,320 miles to the Mississippi Delta, at the gulf of Mexico. With it's many tributaries, the Mississippi's watershed drains into all , or part of, 31 US States. The Mississippi River is the 4th longest and 10 largest, among the world's rivers. For 10,00 years Native American's have lived along the Mississippi. Most were hunters,gathers and herders. A few were mound builders. The Indians depended on the River for many things, water, fish,furs and travel.The Mississippi River Valley is one of the most fertile agricultural regions of the country,formed from thick layers of the Rivers deposits of enriched soil. There has been a saying for years, that the soil along the Mississippi is so rich, all one needs to do, is throw down a seed and it will grow. We have a large burial ground of Early Native Americans ,here in my town , Clarksville. One of the many amazing views as you approach our town. White settlers were soon settling along the river banks as well as the Indians. This brought trouble and tribulations to both parties. The Indians having been there for many years, felt the land was there's. The leaders of the United States felt different. War soon came and many lives were lost. The White man won in the end and the Indians were soon ran off the land. With the White man came the Steamboat.A giant on the water. It changed the travel of the river for ever. Soon it was discovered that the river bottom was not always deep enough for the steamboats, so dredging had to be done. This fixed the river depth problem, but opened a whole new can of warms. FLOODING. You know the old saying,"Don't mess with Mother Nature. "After the steamboats came barge traffic and then Locks and Damn. And the biggest problem yet, LEVEES. 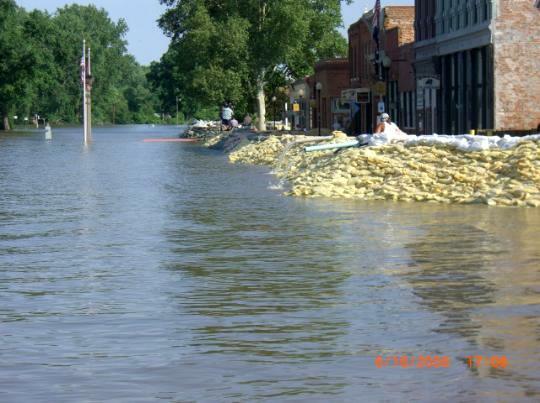 When Levees are built to hold the water back, the river has to expand where it can, often in small towns , that were built on the river banks ,to take advantage of the river travel. Even with out, all the man- made problems, the Mississippi River would flood. It is a right of passage and almost sure to happen in the spring, especially after a long hard winter, filled with heavy snow amounts. Because of all the dredging, levees and locks and damns, the Mississippi River has moved forward and this brings the river closer to towns than it was originally. My Old Historic House, is one that through the years, has been burdened by the ever changing River banks.When my house, The 1845 Historic Elgin/Cottrell house was built in 1845, the Mississippi was a good mile and a half away from the front door. Today it is only about 100 feet. Records show that since 1873, floods have been all around my home. In 1873 the flood crest was 36.70 feet. Flood stage in Clarksville is 25 feet. To get into my house the river has to flood to 38 feet. Other floods on record are: 1983-33.24 ft.1866-33.24 ft.-1993-37.50 ft.(largest yet) -1973-36,70 ft.-2001-34.70 ft.-2008-36.70 ft. I have owned the house since 2006, so I have been through one major flood. I have learned a lot since then and know a little more about what to expect when that old river begins to swell. 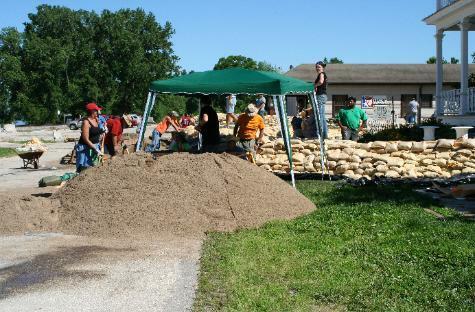 My town, Clarksville, purchased a temporary flood wall since the flood of 2008. We put it up this spring, when there was a threat of flooding. We did not get to test it, and for that I am happy. Plans and drawings are in the works for a real flood wall. I can only hope it will happen soon. The River bank as it looks today, minus this years flood water. Boat docks dot the banks of the Mississippi. For years there has been a Romance connected to this old Mississippi. Books, plays, musical and movies have all been written,produced and filmed about the river and its people. Some as early as 1835- when Samuel Clemens,better known by his pen name, Mark Twain , wrote The Adventures of Tom Sawyer and The Adventures of Huckleberry Finn, in 1886.Twain grew up in Hannibal,Missouri, about 35 miles from me here in Clarksville,Missouri. That town and the Mississippi River provided the setting for his Tom and Huck books. Twain became a master riverboat piolet as well and often traveled up and down this river. Twain is often called, "The Father of American Literature." In the book, Adventures of Huck Finn, Huck and Old Joe, a slave, run away -to find Joe's freedom. They travel down the Mississippi on a home made raft. They leave Hannibal and are headed to Cario,Ill. Illinois was a slave free state. To get from Hannibal to Illinois, they had to travel right through Clarksville,Mo. I am sure, had the story been true, they would have spotted, My old Historic House, right there on the banks.Millions of people, especially students, make a trip to Hannibal every summer to see where this story took place and Mark Twain lived. Missouri home boy, Mark Twain. The second Romantic chapter in the Mississippi River fame is with a Musical called;"Showboat". Showboat is a musical in two acts with music by Jerome Kern, and words by Oscar Hammerstein.It was originally produced in New York in 1927. Based on the 1927 novel with the same name.. The plot chronicles the lives of those living and working on the,"Cotton Blossom", a Mississippi River showboat in 1880. The shows dominant theme include racial prejudice and tragic enduring love. Showboat is widely considered one of the most influential works of the American Musical theater.Show Boat won a Tony award for best revival of a musical in 1995. There were no awards on Broadway in 1927. The song, "O'l Man River',music by Jerome Kern, words by Oscar Hammerstein, from the musical, "Showboat", expressed the African Americans hardships and struggles on the Mississippi River.The song is from the point of view of a riverboat dock hand, "Joe". A luck fisherman and is grandson on the Mississippi River bank in Clarksville.,Mo. I find these little fishermen shacks all up and down the banks. I think it would be fun to spend the night with only an oil lantern . Wonder if there is any spirit? Many other famous movies, musicals and plays have been written and produced about the Mississippi River, far to many to mention. A small list include; The Flame of New Orleans, 1941.--- Naughty Nineties, 1945----The Skeleton Key, 2000. Frankie and Johnny, Elvis Presley.---- Tammy,1967, with Debbie Reynolds,------And, Mississippi -the musical on Broadway. Today the Mississippi is alive with many activities. Fishermen make there livings fishing for: Cat Fish, Carp and Buffalo. Weekenders bring out the boats and skis on beautiful days. Barges travel every hour or so, locking through Locks and Damns all the way, carrying grain, coal and other needed supplies. Riverboats carry passengers as they travel from port to port. The activity on the river in endless and is assuring that that Old Man River is alive and well. People come and just set on His banks and watch the River Roll By. There is a suttle peacefulness about it's waters. Sunset comes and we never want to go home. I often set on my upstairs porch and listen, late at night ,as the water slaps the banks. In the distance a light from a barge or boat. I always feel at home, right there on the banks of the Mighty Mississippi, the Father of all Water. Come by any time for a tour. I will fix us a glass of sweet tea, we can set on the porch, catch a Blue Heron fly by and hear the steamboat music in the distance,. And, Sissy Dog will be waiting with a jump and a kiss. "Rolling, Rolling on the River." I guess is does! Want to try it and see if the road really ends? 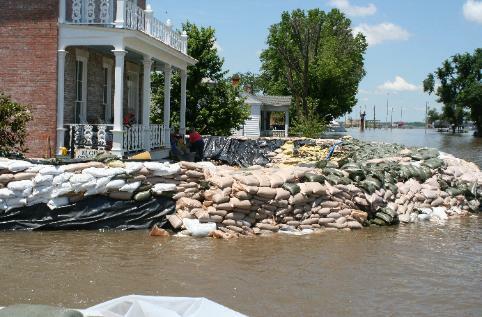 Sandbags in front of, My Old Historic House, Mississippi River flood 2008. This is the view my visitors have as they approach ,My Old Historic House. This was taken last night from my side porch . This is how, My Old Historic House, looks as you pass by on the river.